Brian Prato, Operations Director for the U.S. Army All-American Marching Band and the Jersey Surf, submitted this photo and caption. 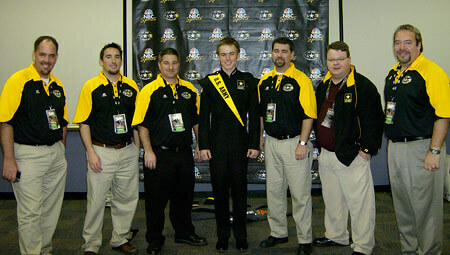 Past and present members of the Cadets participated in the U.S. Army All-American Bowl on Jan. 5, 2008 with the inaugural U.S. Army All-American Marching Band. From left: Vince Gardner (1993), Brian Stockard (2000), Brian Prato (1989-1990), All-American Ben Pouncey (2007), Trey Harris (1991-1992), Brad Barnes (1991-1993, staff 1997-1998), Marc Whitlock (1987, staff 1988, 1994-1999). It was great trading stories with Ben about how things were "back in the day." We had three decades represented and were thrilled that a current Cadets member was selected to participate. For more information about the U.S. Army All-American Marching Band, visit MENC.org/All-American.